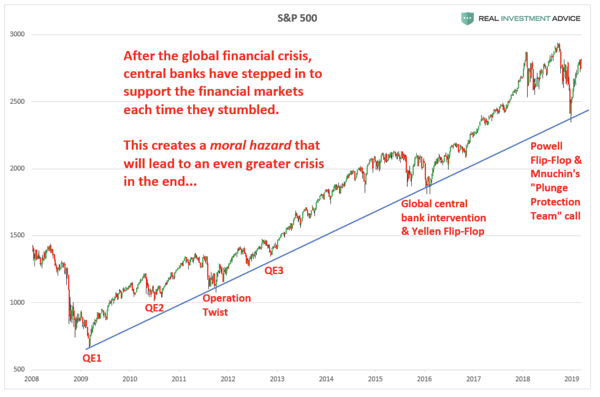 Almost everyone who has dedicated their money, time and/or careers to crypto is naturally skeptical of inflated equity prices, the systemic risks of the banking system, and irresponsible global government spending. So it’s not without bias when we say that this week has us legitimately frightened. That said, even the biggest equity bulls have to pause right now. The U.S. and European data, coupled with the Fed’s about-face, was enough to reignite the “global growth concerns” theme and spur a flight to safe havens like U.S. Treasuries and German sovereign debt. The current macro landscape is also undoubtedly causing significant flows into crypto. To the uninitiated, crypto is certainly not acting as a safe haven yet. Those not in this market every day probably see Bitcoin prices stuck in a range, and the all too frequent “Bitcoin is dead” headline from the media. Even if you look beyond Bitcoin to the 2nd level, most crypto indices that contain the top 10 or 20 digital assets by size have been stuck in the mud as well. But there is a 3rd level happening below most people’s radars that may be more suggestive of the actual tone in crypto. As we alluded to earlier this month, a burgeoning small-cap rally has continued throughout the month. This bifurcation is real, even if some of the components of this rally may not be. And certain sub-sectors within the small caps are absolutely flying right now. 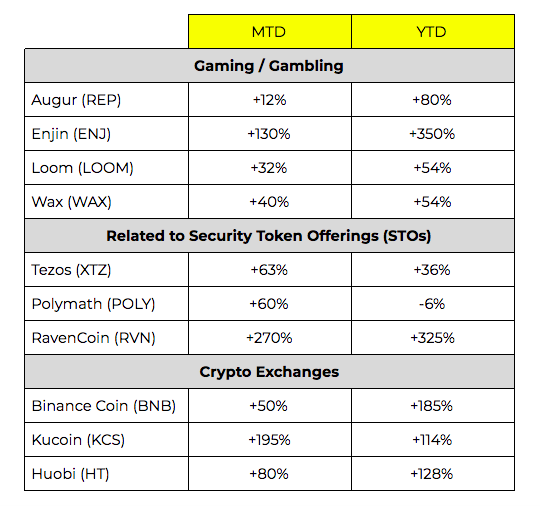 Tokens related to gaming, crypto exchanges, and the growing security token offerings (STOs) market are on fire (more on this later). Additionally, those tokens that haven’t yet participated in the rally are starting to play catchup, as relative value arguments make some tokens look cheap versus their comps. While this niche investing is too small to matter in the larger scheme of crypto, the underlying positive sentiment created by these gains is real. As a result, for the past few weeks, even when we get the standard “flash crash” or “crypto selloff” in Bitcoin and other more well known tokens, the magnitude of these dips is far less impactful. Most price declines don’t even last 24 hours anymore before prices stabilize and recover, and almost none of these dips are large enough to scare anyone. Typically these selloffs are exacerbated by momentum selling and stop loss hunting -- recently, they have only triggered limit order buying. 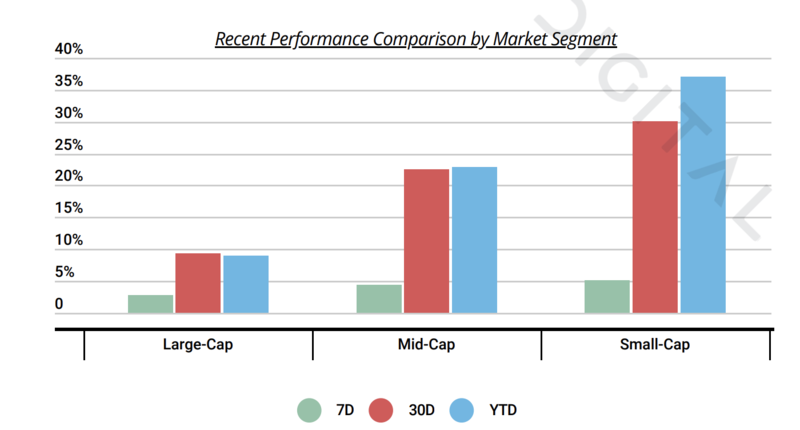 As a result, the average move lower is nothing more than a pedestrian 3-5% dip instead of the 10%+ heart-stopping down trades that plagued most of 2018. Said another way, every dip is being bought immediately. This leads to a stable environment with increased confidence and lower volatility, which makes hedging cheaper and allows investors to be a little more aggressive - thus fueling the small-cap rally further. So while crypto is not yet a safe haven -- everything trickles down. The macro environment leads to outflows of risky assets, and it doesn’t take much trickling into crypto to start a wave of buying, which in turn leads to more buying. When we say certain sectors are flying, we don’t mean they are slightly outperforming the benchmarks. They are running like Usain Bolt. In some cases, these large moves are caused by bots/algos pushing around the prices of illiquid tokens, but in other cases these moves indicate real long-lasting value capture in sectors where the use of digital assets makes a lot of sense. More importantly, it is representative of the uniqueness of certain token structures compared with traditional investment vehicles like equities and debt. When you own the equity or debt of a company -- you know what you are getting. With equities, you own a share of profits, potential dividends, and a residual claim on all net assets. With debt, you are entitled to interest on your loan and have a senior claim on assets. 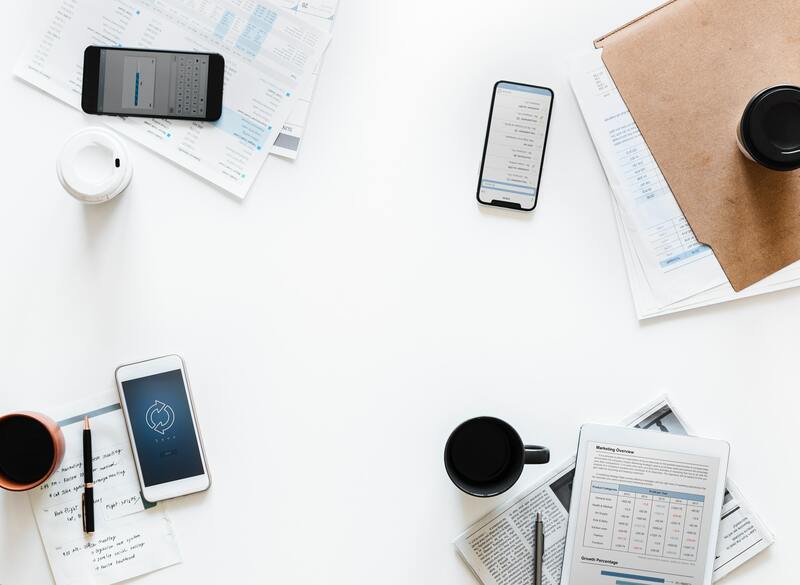 But as a company’s business model shifts, you don’t have much flexibility with what you own, and more importantly, neither does the company. But with tokens tied to crypto business and projects, the token is only loosely backed by the underlying entity. This of course creates difficulty when trying to value the price of a token using traditional valuation techniques, but it also creates opportunity for smart business owners and project creators to pivot or be a copycat. When this happens, token holders benefit. Early stage companies pivot… a lot (we beg you to click this link, it’s amazing). If you’ve ever invested in, or seen the investor deck of a Seed round or Series A company, you know that the company that emerges two years later looks nothing like the one that raised money. 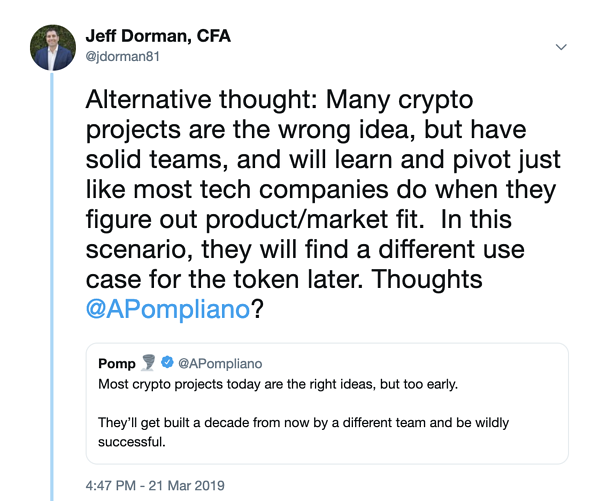 This of course will be true of crypto companies as well. Many of these companies issued tokens instead of equity, which were meant to serve some sort of utility for users and developers in the growing ecosystem of this nascent technology. But when these businesses pivot, they can simply make up a new use case for their token. While this may invalidate the ICO, it might end up being the best thing that ever happened to token holders who believed in the founding team. We are watching this play out in real-time with the most successful crypto company to date, Binance. Binance issued a token (Binance Coin - BNB) that was initially used solely for receiving discounts on fees when you trade on its exchange. But as Binance has grown to a super power, they continue changing the token rules -- in a positive way. BNB can still be used for discounted trading fees, but it can also be used to pay for hotels in Asia, to purchase virtual land on Dentraland, and most recently to purchase the latest craze called Initial Exchange Offerings (IEOs). Most recently, Binance has changed the rules again to reward larger, longer-term holders over smaller, short-term holders. These pivots are creating value for token holders, and were not known to anyone including Binance when these tokens were first issued. Its success has naturally spawned copycats, which has led to the price rally for other exchange tokens, seen in the table above. Once again, because these token use cases can be changed on the fly, any exchange can not only try to copy Binance’s success, but they can change the utility of their token as well. Basic Attention Token (BAT) is a great example of a pivot that we’ll likely see in the future. On an abstract basis, BAT tokens should not capture any value, as the token is simply not needed (for those who don’t know, it is designed to be used by content creators, advertisers and consumers of internet content using the fast growing Brave Browser). On the other hand, BAT benefits from the success of the Brave Browser. Absent changes in the token mechanics, we don’t expect BAT will capture value in the long run, but it would be foolish to lock BAT in to its current limited use case. They can, and will pivot. This comes down to a basic “function vs distribution” argument. If you have distribution, you can likely create function later. But if you have function, the odds are still stacked against you to create distribution. Imagine for a second how many different ways an Amazon token could be used right now, and might have pivoted, given the scale of its business and size of its customer base. This is why many people, including our team, are so excited about the future “tokenization”. The crypto markets feel healthy, with half of the Top 100 tokens trading up, and half trading down week-over-week. But the magnitude of the gains is outpacing the losses. After running up 13% over the previous week, Stellar (XLM) actually fell 10% week over week. The big news that caused the price increase was announced Monday at Asia Money 2020: IBM is launching its World Wire product with six banks. World Wire allows their clients to transfer money on the Stellar network, using bank-issued stablecoins. Transaction fees will be charged in Stellar’s native token Lumens (XLM). Tezos (XTZ) was up 67% last week after the network completed its first on-chain governance vote. This is the first time a blockchain network has voted on a programmatic system wide upgrade that does not require human involvement. Ravencoin (RVN) is up a whopping 95% after Overstock CEO Patrick Byrne explained how the blockchain network fit into Medici Ventures portfolio during an interview with The Digital Wrapper last week. He explained that as a blockchain that is focused on asset and securities transference, Ravencoin makes a lot of sense to incorporate for tZero and other projects that Medici is involved with. Numeraire (NMR) saw gains of 45% after Placeholder VC and Paradigm Ventures announced they had directly purchased $11m worth of NMR tokens. It’s been a while since the crypto world has seen a token-only venture deal as most have shifted towards equity. Huboi Token (HT) is up 22% as it gears up for the launch of Huobi Prime, it’s newest product that aims to compete with Binance’s Launchpad. Huobi Prime will launch this week and “promises to be a better way of investing in crypto projects”. Fidelity National Information Services’ (FIS) purchased WorldPay for $35b in a mega-deal that has the blockchain world buzzing. 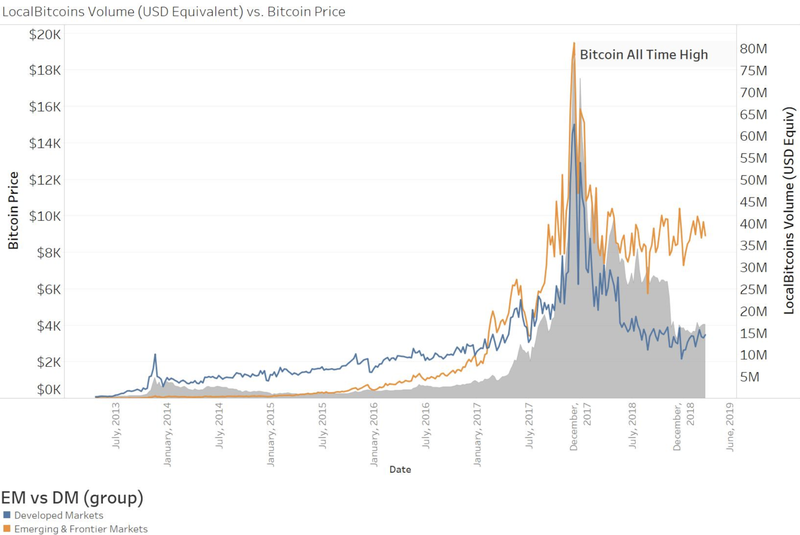 For context, this M&A deal is larger than the top cryptoasset networks (excluding Bitcoin). The deal is not surprising considering that the payments industry is expected to see $2.4 trillion in revenue in 2020. Bitwise Asset Management, one of the firms that has filed for a Bitcoin ETF with the SEC, has released a report showing that 95% of Bitcoin exchange volume is faked. The report was released in an effort to educate the SEC and general public about the cryptocurrency markets and make the case for an ETF product (e.g. we all know what is faked, so let’s focus on what is real and build around that). We often forget about the areas beyond the US that are utilizing crypto and blockchain in new and novel ways. Last week, messaging app Kakao, based out of South Korea, announced that it would be integrating a crypto wallet into its platform. This would allow its 44 million users to access, send, receive and store cryptocurrencies, as well as run blockchain applications, all through their app. A “halving” is when a Proof-of-Work network decreases the block reward size, thereby limiting the number of newly minted tokens. This is a unique economic event that occurs within blockchain ecosystems. Bitcoin’s halving, which is expected in May of 2020, has many speculating that it will fuel the next bull run. This piece from Grayscale Investments explains the halving event and what investors can expect in 2020. The SEC is apparently growing concerned with M&A activity in the fund management space, as small and midsized funds struggle to compete. These smaller funds are being absorbed by larger groups, which may seem positive, however, the SEC argues that this decreases investor choice. Dalia Blass of the SEC’s investment management division said last week that they would look at whether technologies such as blockchain could improve access to fund distribution for small and midsized managers. Albert Wenger of Union Square Ventures discusses the shift in value from applications that interface with the protocol level to the network protocol level. He argues that since crypto networks are not developed by researchers or non-profits, but instead by groups that are compensated via token value, development occurs at a much faster pace than past technological innovations. Although this piece is a few years old, it highlights a trend that still holds true today. Arca CEO Rayne Steinberg released a timely piece discussing what the Fed’s decision means for the future of the US Dollar, and more importantly, the future of Bitcoin. This is a must read. 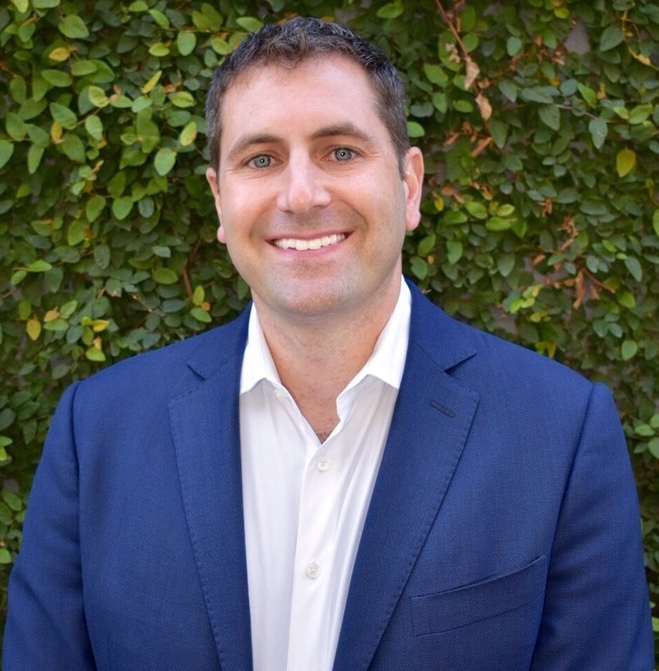 Arca CIO Jeff Dorman was quoted in The Block last week where he discussed Binance’s new margin trading product. Arca Head of Strategic Relations, David Nage, wrote his 2nd installment of “Signal to Noise”, where he focuses on the elements of crypto that truly matter (like new entrants like Square, Twitter, Morningstar, Bloomberg, Reuters and large VCs) versus those elements that add little value (like price predictions).